This great family home is located in a secure compound within easy reach of Phrom Phong BTS and local Sukhumvit amenities. 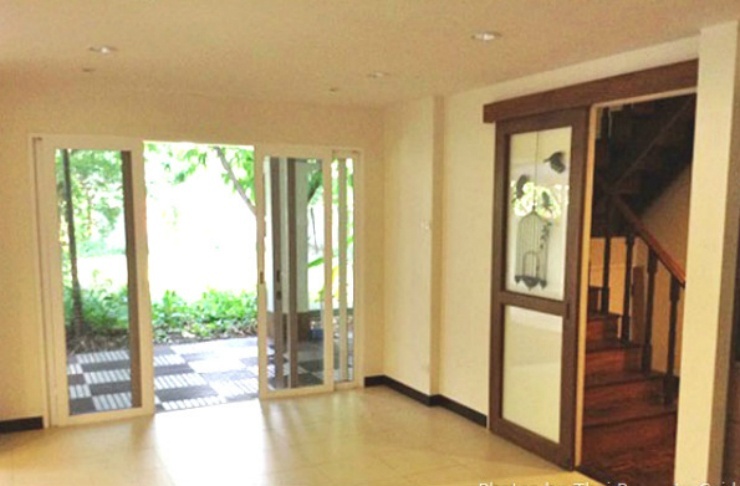 This detached house in Phrom Phong covers 300 sq.m has been recently extensively renovated to provide great accommodation downtown for any family. The house has a bright airy livingroom, separate dining room, guest bathroom, fully fitted kitchen, maids room and storage downstairs. Upstairs there are 3 large bedrooms with 2 bathrooms. The house has a large garden and lawn giving children plenty of safe playing area and the property is pet friendly. There is covered parking for up to 3 cars. The compound has 24 hour security. Available for minimum 1 year rental contract. The owner will allow pets (cats / small dogs). This property is a detached 2 storey 3 bedroom house with a garden set in a secure compound.